Note: This is the 400th article here on LSS Academy! I’ll take some time to reflect on this in the near future. But for now, I have a far more important topic to discuss. Read on. Times are tough. Real tough. You may have recently lost your job. You may be worried about losing your job. You may be worried about making payroll this month. No matter the situation you’re in… chance are… things have been a lot better than they are now. What to do? I’ll tell you exactly what I think you should do. Invest. Yep, that’s right. 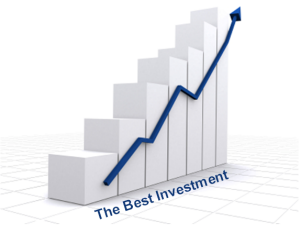 You and I need to invest like never before. And before you think I’m crazy I am not proposing you invest in the stock market, housing market, or anything like that. Nope. I am talking about investing in two particular things – yourself and your company. Let’s begin with you. Here are some tips for how you can invest in yourself. Make something happen. You have the knowledge. You have the will. Now it’s time to do something with these attributes. Go to your gemba – or the place the work is done – and attack the waste that’s devouring your company. It’s there. I promise. Find it… then kill it. Learn something new. I don’t care what it is. Learn something new and learn it this week. Need help? Click here. Help others. I assure you someone has it worse off than you. Find them and help them. You’ll help yourself more than you know. Stop worrying. Lastly, worrying is natural. It’s also detrimental to success. So try to stop worrying and instead start focusing on the three points above. Now that we have you taken care of let’s switch gears and talk about how you can invest in your company. Run a kaizen. Find something to improve. Assemble a team. And hit it. And hit it hard. Then when you’re done – repeat. Light the fire. Ever heard of the burning platform? Now is the time to light a few while pouring gasoline all over them (metaphorically speaking of course). Ask how you can help. Not sure what you can do to help your company? Ask someone. If they don’t know ask someone else. Do you agree with this advice? If so, why? If not, why? Do you have anything to add to the ideas above? Congratulations on the 400th post! Man that is a lot of writing. I also enjoyed this article. What you said is simple but sometimes knowing things and doing things are very different. This has encouraged me to stop moping around. Thanks and look forward to your next 400! What a great post. You are right on the money. Thank you and God bless you.